After decapitating zombies all day, refresh yourself with The Walking Dead-styled drinks! Silicone rubber tray inspired by the comic book series. Shape ice cubes, Jello, and more into zombie body parts and The Walking Dead logo! When you've been decapitated zombies in the hot sun all day, what could be more useful and appropriate than this The Walking Dead Ice Cube Silicone Tray? After all, shouldn't your ice be as exciting as your post-apocalyptic lifestyle? 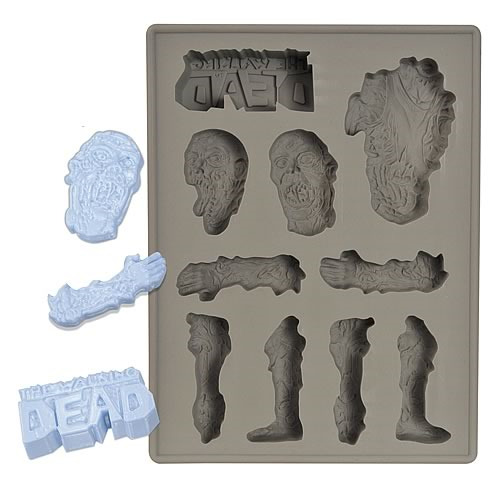 With this silicone rubber tray, you'll be able to cast up chunks of ice or chocolate in the shape of zombie body parts, as well as the famous The Walking Dead comic book logo! Turn any party into an undead war zone with The Walking Dead Ice Cube Silicone Tray. Ages 8 and older.